You see, Optimist International understands that not everyone wants to commit to attending meetings. They know that businesses would like to support our clubs even though the owner or manager can't be away from work at the time the club meets. 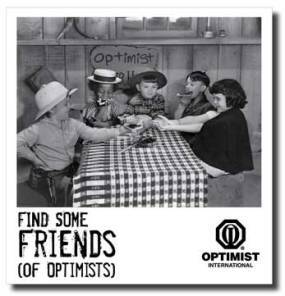 The value of the Friends of Optimist membership option is that it allows a new member to associate with your Optimist Club at the level that appeals to them with no other strings attached. Your club and Optimist International will communicate with Friends, and when the time is right, we believe that Friends will become more involved, maybe with donations or maybe with time. Add 3 Friends of Optimist to your club between January 1 and June 30, 2011 and your club will get to add 1 new traditional member at no charge for processing and no charge for International Dues until September 30, 2012. The new traditional member must be added by August 31 of the current Optimist fiscal year. Waiving dues, and receiving banner patches are not the reason to add members. Those are merely a thank-you for doing so. The reason we add members is to share our passion with others. Won't you do that? Share what you like about being a member and ask someone to join your Optimist Club, as a Friend of Optimist or a traditional member, today.